Junctional ectopic tachycardia (JET) presents in two scenarios: The rarer idiopathic and incessant form seen early in infancy with a structurally normal heart and the more common self-limiting variety limited to the early postoperative period after surgical repair of congenital heart disease. Diagnosis of JET generally requires a heart rate greater than 170 beats per minute with QRS morphology similar to the sinus rhythm QRS complex, atrioventricular dissociation, and ventricular rate faster than the atrial rate. JET can occur at a lower rate in adult population with increased vagal tone and slower atrioventricular (AV) conduction as compared to children. It can also present with 1:1 retrograde ventriculo-atrial conduction. In patients with postoperative bundle branch block, JET can manifest as wide QRS tachycardia with atrioventricular dissociation or 1:1 retrograde ventriculo-atrial conduction. In this scenario, the P waves may fall within the QRS or ST-T segment. At fast rates, sinus tachycardia and supraventricular arrhythmias can pose a diagnostic challenge. P waves can be the clue in such situations that can be identified with oesophageal leads or Lewis leads or the atrial pacing wires. Risk factors associated with JET include younger patient age, duration of CPB and aortic cross-clamp time (ACC), electrolyte disturbances, use of inotropes and type of surgery. , Several studies have elucidated the risk factors associated with JET. [Table 1] Although higher dose of inotropic agents have been accepted in all major studies as a significant risk factor, the role of surgery involving peri-nodal areas is still debated. Moak et al.,  in their recent study had categorically refuted mechanical injury to the AV node area as a strong risk factor for postoperative JET. The prospective study on postoperative JET by Abelaziz et al.,  published in this issue of the Annals, has analyzed 194 patients after their cardiac surgery under CPB. They have divided their cohort into 3 groups - one with postoperative JET, one with other postoperative arrhythmias and finally those with no arrhythmias. This division further helps to highlight the risk factors that may be more specific for JET with respect to other postoperative arrhythmias. They have used the conventional measures to diagnose JET, but have still highlighted the importance of atrial leads, Lewis leads and esophageal leads in confirming their diagnosis. 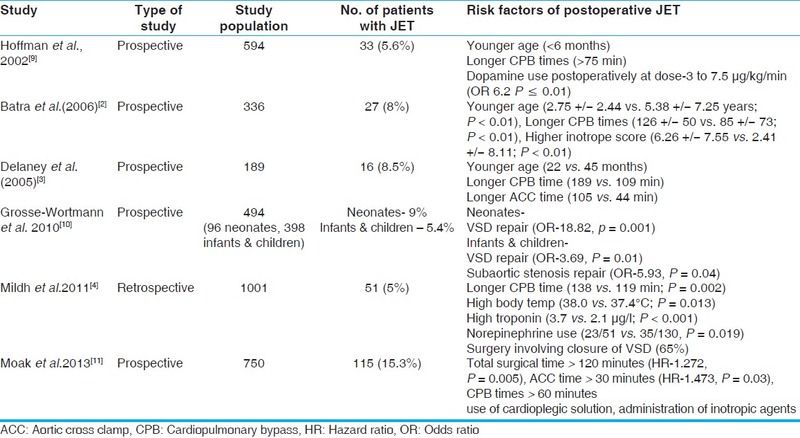 It is interesting to note that risk factors when compared between the 3 groups mentioned above have shown that CPB, aortic cross clamp time and postoperative use of inotropes were significantly higher in postoperative JET patients but there was no significant difference in these parameters between non-JET arrhythmia group and no arrhythmia group. This clearly highlights the importance of perioperative factors being a major determinant of JET and anatomical factors being a minor determinant only. The structural abnormalities and their corresponding electrophysiological changes may be stronger determinants of non-JET arrhythmias. The management of JET patients requires a staged therapeutic approach beginning with conventional measures that include active avoidance of hyperthermia, optimal sedation and pain control and minimizing exogenous catecholamines. In one of the earlier publications evaluating the effectiveness of a staged protocol, Walsh et al.,  found that conventional measures could control JET in 24% of patients. Based on available data and institutional experience, they refined their original protocol by avoiding ineffective drugs like digoxin, verapamil, propranolol and phenytoin. These measures significantly reduced the time to JET control. In the case of non-responders or patients with hemodynamic instability, they have followed a sequential order of atrial pacing, induction of hypothermia with posterior cooling blankets and finally a combination of hypothermia and antiarrhythmic drugs like amiodarone and procainamide. In 70 of their 71 patients, JET was managed successfully with 63 patients responding within 2 hours. The incidence of JET has gradually declined over the years with improved surgical techniques and preventive measures like minimizing inotropic usage and avoiding hyperthermia in the postoperative period. But JET continues to contribute significantly to postoperative morbidity. Management of JET with general supportive measures, active surface cooling and antiarrhythmics like amiodarone has reined this postoperative hazard to a great extent. 1. Herzog L, Lynch C. Arrhythmias accompanying cardiac surgery. In: Lynch C, editor. Clinical Cardiac Electrophysiology. 3 rd ed. Philadelphia: JB Lippincott; 1994. p. 231-58. 4. Mildh L, Hiippala A, Rautiainen P, Pettila V, Sairanen H, Happonen JM. Junctional ectopic tachycardia after surgery for congenital heart disease: Incidence, risk factors and outcome. Eur J Cardiothorac Surg 2011;39:75-80. 5. Dodge-Khatami A, Miller OI, Anderson RH, Gil-Jaurena JM, Goldman AP, de Leval MR. Impact of junctional ectopic tachycardia on postoperative morbidity following repair of congenital heart defects. Eur J Cardiothorac Surg 2002;21:255-9. 6. Walsh EP, Saul JP, Sholler GF, Triedman JK, Jonas RA, Mayer JE, et al. Evaluation of a staged treatment protocol for rapid automatic junctional tachycardia after operation for congenital heart disease. J Am Coll Cardiol 1997;29:1046-53. 7. Dodge-Khatami A, Miller OI, Anderson RH, Goldman AP, Gil-Jaurena JM, Elliott MJ, et al. Surgical substrates of postoperative junctional ectopic tachycardia in congenital heart defects. J Thorac Cardiovasc Surg 2002;123:624-30. 8. Pfammatter JP, Paul T, Ziemer G, Kallfelz HC. Successful management of junctional tachycardia by hypothermia after cardiac operations in infants. Ann Thorac Surg 1995;60:556-60. 9. Hoffman TM, Bush DM, Wernowsky G, Cohen MI, Wieand TS, Gaynor JW, et al. Postoperative junctional ectopic tachycardia in children: Incidence, risk factors and treatment. Ann Thorac Surg 2002;74:1607-11. 10. Grosse-Wortmann L, Kreitz S, Kreitz RG, Vasquez-Jiminez JF, Messmer BJ, von Bernuth G, et al. Prevalence of and risk factors for perioperative arrhythmias in neonates and children after cardiopulmonary bypass: Continuous holter monitoring before and for three days after surgery. J Cardiothoracic Surg 2010;5:85. 11. Moak JP, Arias P, Kaltman JR, Cheng Y, McCarter R, Hanumanthaiah S, et al. Postoperative junctional ectopic tachycardia: Risk factors for occurrence in the modern surgical era. Pacing Clin Electrophysiol 2013;36:1156-68. 12. Abelaziz O, Deraz S, Anticipation and management of junctional ectopic tachycardia in postoperative cardiac surgery: Single center experience with high incidence. Ann Pediatr Card 2014;7:19-24. 13. Rekawek J, Kansy A, Miszczaj-Knecht M, Manowska M, Bieganowska K, Brzezinska-Paszke M, et al. Risk factors for cardiac arrhythmias in children with congenital heart disease after surgical intervention in the early postoperative period. J Thorac Cardiovasc Surg 2007;133:900-4. 14. Valsangiacomo E, Schmid ER, Schupbach RW, Schmidlin D, Molinari L, Waldvogel K, et al. Early postoperative arrhythmias after cardiac operation in children. Ann Thorac Surg 2002;74:792-6. 15. Manrique AM, Arroyo M, Lin Y, El Khoudary SR, Colvin E, Lichtenstein S, et al. Magnesium supplementation during cardiopulmonary bypass to prevent junctional ectopic tachycardia after pediatric surgery: A randomized controlled study. J Thorac Cardiovasc Surg 2010;139:162-169.e2. 16. Mahmoud AB, Tantawy AE, Kouatli AA, Baslaim GM. Propranolol: A new indication for an old drug in preventing postoperative junctional ectopic tachycardia after surgical repair of tetralogy of Fallot. Interact Cardiovasc Thorac Surg 2008;7:184-7. 17. Kovacikova L, Hakacova N, Dobos D, Skrak P, Zahorec M. Amiodarone as a first-line therapy for postoperative junctional ectopic tachycardia. Ann Thorac Surg 2009;88;616-22. 18. Kelly BP, Gajarski RJ, Ohye RG, Charpie JR. Intravenous induction of therapeutic hypothermia in the management of junctional ectopic tachycardia: A pilot study. Pediatr Cardiol 2010;31:11-7. 19. Chrysostomou C, Beerman L, Shiderly D, Berry D, Morell VO, Munoz R. Dexmedetomidine: A novel drug for the treatment of atrial and junctional tachyarrhythmias during the perioperative period for congenital cardiac surgery: A preliminary study. Anesth Analg 2008;107:1514-22. 20. LeRiger M, Naguib A, Gallantowicz M, Tobias JD. Dexmedetomidine controls junctional ectopic tachycardia during Tetralogy of Fallot repair in an infant. Ann Card Anaesth 2012;15:224-8. 21. Bronzetti G, Formigari R, Giardini A, Frascaroli G, Gargiulo G, Picchio FM. Intravenous flecainide for the treatment of junctional ectopic tachycardia after surgery for congenital heart disease. Ann Thorac Surg 2003;76:148-51. 22. Mandapati R, Byrum CJ, Kavey RE, Smith FC, Kveselis DA, Hannan WP, et al. Procainamide for rate control of postsurgical junctional tachycardia. Pediatr Cardiol 2000;21:123-8. 23. Sasaki T, Nemoto S, Ozawa H, Katsumata T, Ozaki N, Okumura K, et al. Successful administration of nifekalant hydrochloride for postoperative junctional ectopic tachycardia in congenital cardiac surgery. Kyobu Geka 2007;60:1022-6. 24. Tsoutsinos AJ, Papagiannis J, Chatzis AC, Sarris GE. Surgical cryoablation for life threatening postoperative junctional tachycardia. Ann Thorac Surg 2007;84:286-8. 25. Braunstein PW Jr, Sade RM, Gillette PC. Life-threatening postoperative junctional ectopic tachycardia. Ann Thorac Surg 1992;53:726-8.